The Obama administration has vehemently denied charges that Ukraine’s nascent regime is stock full of neo-fascists despite clear evidence suggesting otherwise. Such categorical repudiations lend credence to the notion the U.S. facilitated the anti-Russian cabal’s rise to power as part of a broader strategy to draw Ukraine into the West’s sphere of influence. Even more disturbing are apologists, from the American left and right, who seem willing accomplices in this obfuscation of reality, when just a cursory glance at the profiles of Ukraine’s new leaders should give pause to the most zealous of Russophobes. It isn’t too surprising that conservative outlets like FOX News would downplay Russian allegations but the so-called “liberal” press has also contributed to the American disinformation campaign. Celestine Bohlen from The New York Times considers harsh epithets, like the word “neo-Nazi,” which Putin has hurled at the demonstrators in Kiev as part of a Russian propaganda effort to tarnish Ukraine’s revolutionary struggle against authoritarianism. 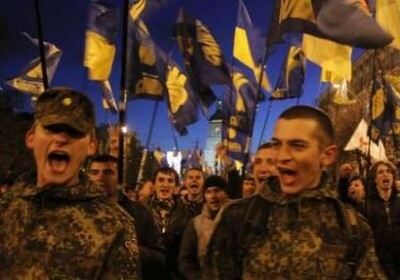 Yet after simply Googling the terms “Ukraine” and “Neo-Nazi,” the official position of the United States government along with the stance taken by many in the American media both now seem quite dubious, if not downright ridiculous, especially considering that one would be hard-pressed to machinate the lineup that now dominates Ukraine’s ministry posts. Last week Per Anders Rudling from Lund University in Sweden, an expert on Ukrainian extremists, told Britain’s Channel 4 News: “A neo-fascist party like Svoboda getting the deputy prime minister position is news in its own right.” Well, except in the U.S. Even more disconcerting has been the emergence of phone intercepts between high-ranking U.S. and Ukrainian officials which make it look as if the U.S. was basically, in the words of Princeton’s Stephen Cohen, “plotting a coup d’état against the elected president of Ukraine.” In other words, the U.S., in addition to providing moral support, may have paved the way for extremists to seize power in Kiev. Such a development would counter the American right’s condemnation of Obama for not “engaging” in the world. The real problem is actually the administration’s over-engagement in this case — as in meddling in the affairs of another state and trying to rearrange its domestic political machinery to suit Washington’s agenda. Be they radical mujahideen or neo-fascists, Washington certainly has a penchant for bolstering shadowy forces, usually labeling them with risible euphemisms like “freedom fighters,” in order to satiate short-term geopolitical needs, despite said factions being inimical to America’s true long-term interests.